As Halloween approaches and the nights draw in, I thought I’d suggest something seasonal. An evening by the fire with a good ghost story is one of the pleasures of autumn, and this selection, spanning the twentieth century, has plenty to offer. An unexpectedly shivery tale from Richmal Crompton, for instance, or Ruth Rendell’s The Haunting of Shawley Rectory, which begins with a haunting and ends in murder. 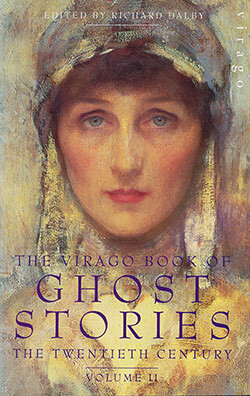 Those with a darker turn of mind will appreciate Antonia Fraser’s deeply disturbing tale of a haunted car, while Mary Elizabeth Counselman’s House of Shadows sees a young woman spend a convivial night with her friend and the shades of her family, in a narrative which challenges the notion of the ‘typical’ gothic ghost story. My favourite, by far, is No. 17. In this acutely observed tale, Edwardian travelling salesmen spin ghostly yarns around their hotel fireside. There’s a playful mind at work, here, and sly humour, with mounting suspense as the story unfolds. You will find yourself leaning in to hear the awful events that happened in room 17, and you’re bound to enjoy the masterful twist at the end. But the biggest surprise for me, was the author: E. Nesbitt, of Railway Children fame. I hadn’t known until then that Nesbitt wrote ghost stories; No. 17 sent me in search of more.